We are currently accepting applications through March 4 from all interested NC educators. 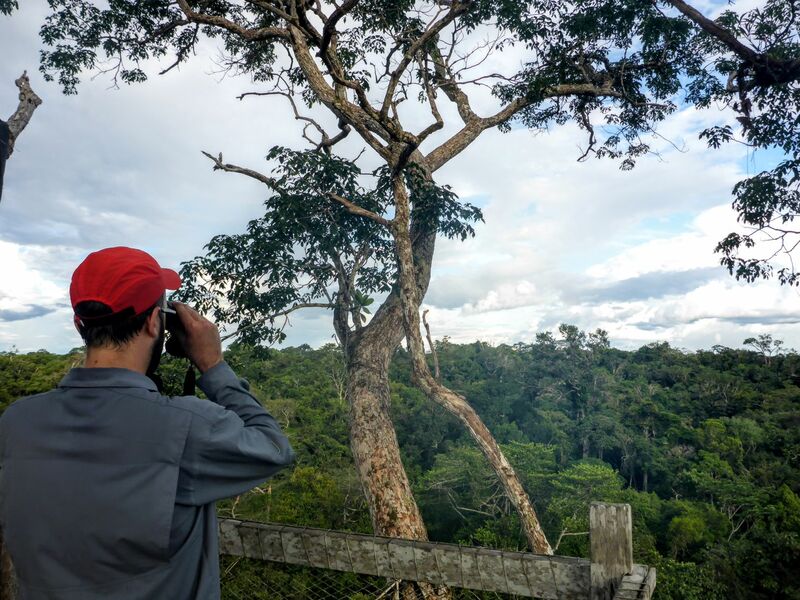 Please consider joining us, or encouraging another educator you know to consider applying for our upcoming adventure to the Amazon rainforest of Peru! Our last full day in Belize! Woke up after last night’s tropical rain to a cool, refreshing breeze. The sunrise was beautiful as evident in the pictures taken by the early morning kayak crew. After breakfast we discussed the sadness of having to return to the real world and the absence of a cook/chef, wait staff, and Nathan to guide us through the day. We visited Carrie Bow Caye Smithsonian Research Station to get an up-close view of the work being done on corals along Belize’s barrier reef. We learned that the researchers are anxiously awaiting the annual coral spawn and are hoping it will occur tonight (the 31st). The coral spawn is being used to study the effects of ocean acidification on coral polyps. Zach, the station manager, showed us two nesting sites for Hawksbill Sea Turtles that were made last night! Babies should hatch in 60 days. Originally we had planned to snorkel in the Mangroves, but last night’s rainstorm stirred up too much sediment. Not wanting to miss our 5th snorkel opportunity, we traveled to another patch reef to see what we could see. Despite some serious chop, everyone was excited about the diversity of corals, as well as seeing a large stingray, barracuda, many spiny sea urchins and a Nurse Shark. Our last night began with hilarious group “presentations.” Each team reflected on our experience in a creative skit. The skits began with the leaders’ brief presentation and ended with “The Beast,” a tradition since 1987. Thank you Tony Rath photography! We had a fabulous night snorkel and are grateful to Tony Rath photography for capturing our group under the Milky Way! We awoke on the island at South Water Caye with the breeze drifting in through the open door and palm trees. A handful of us adventured out early before our full day to enjoy a quiet morning kayaking to enjoy the sunrise. We spotted cormorants feeding and a rainbow to greet us as we started our day. After a breakfast of creole bread (similar to sourdough), eggs, breakfast sausage, and fried beans, we took a short walk around the island. 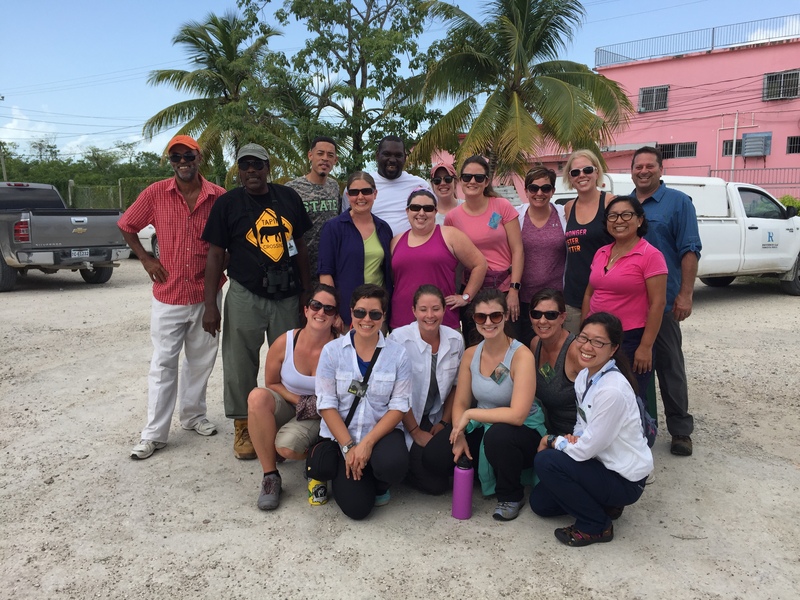 All of our educators were assigned expert topics before we arrived in Belize, and we were able to hear about conch shells, pumice, mangrove trees, coconuts and the Magnificent Frigate birds found on the island. Nathan demonstrated how to remove the tough husk from a coconut by impaling it on a stake and then using a machete to get to the coconut meat on the inside. Only the brave of heart tried to do the same! We headed out for our first of three snorkels of the day to the Aquarium Reef, a pristine part of the Belize Barrier Reef. The Belize Barrier Reef is the second largest reef in the world, and the the largest living reef. It is estimated that close to 90% of the reef is healthy, as evidenced by the vibrant colors of the coral and biodiversity we witnessed. On the reef, we saw stingrays, schools of fish and a few of us even spotted a Hawksbill Sea Turtle swimming! We saw squid, and held conchs and touched a sea cucumber. After lunch, we snorkeled closer to the island and paired up, trying to observe a particular fish’s activity. We came back together in the evening where we shared about our first day on the island and then mentally prepared ourselves for a night snorkel. We broke into small groups with dive flashlights and glow sticks and slowly snorkeled, looking for octopuses, lobsters and sleeping fish. The reef is just as breathtaking at night. 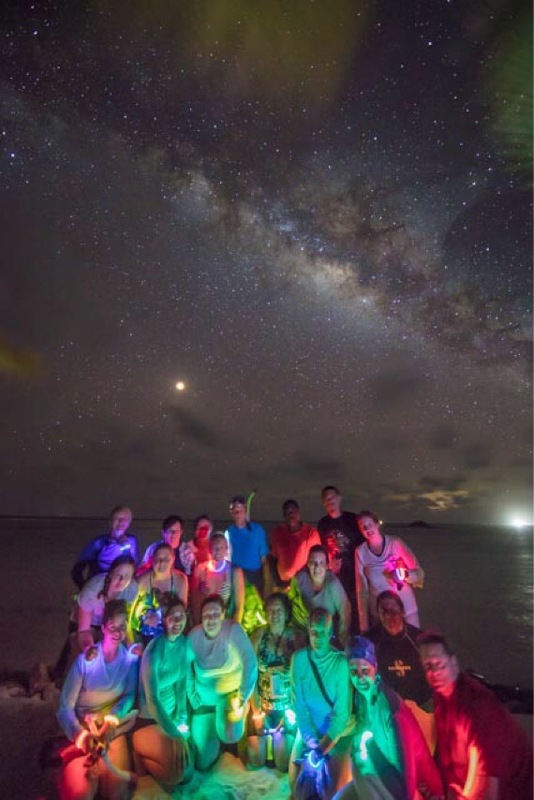 A friend on the island took a picture of our group where the Milky Way and stars were bright in the background. The sight of the countless stars and sounds of the storm rolling in lulled us all to a restful sleep and another beautiful memory of Belize. 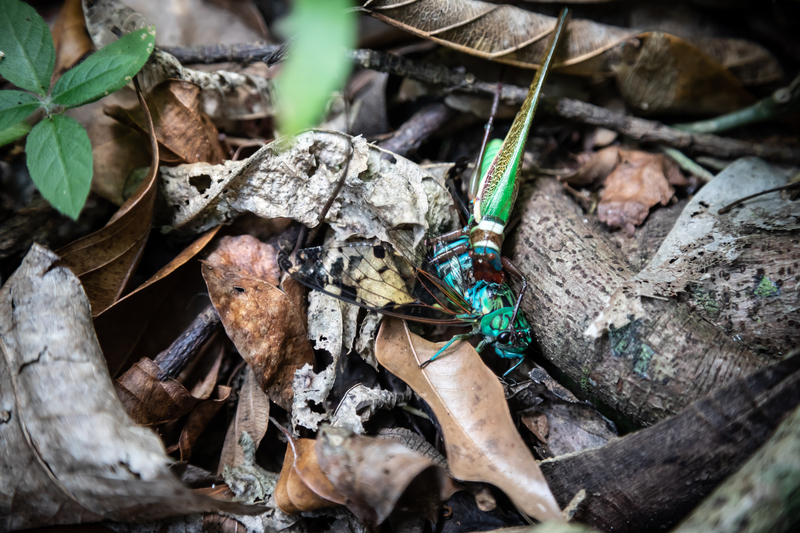 During our last night in the Jaguar Preserve we took a short walk to find Jason’s Favorite Bug — the Dragon Head Bug. It is only found on one species of tree, and spends the day in the canopy before coming down the trunk at night. Sure enough, we found it on the tree where Jason had spotted it last year! After a delicious breakfast that included johnny cakes, we set off for the Ben’s Bluff Waterfall. 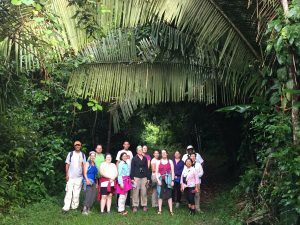 We enjoyed hiking through the jungle, marveling at the buttress roots, huge philodendron, and beautiful tropical heliconias. The waterfall was beautiful. 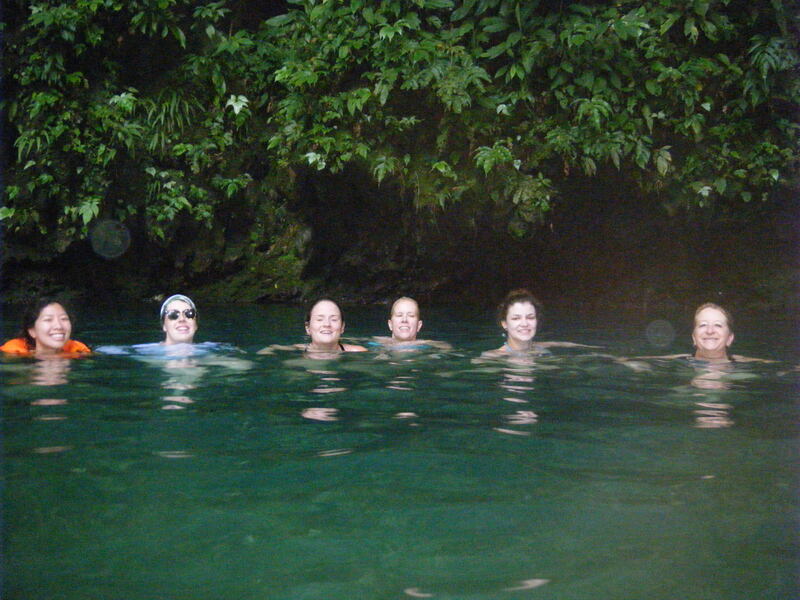 We were able to swim back to the little grotto created by the force of the water. Back there we found a small bird nest with two eggs. We think it is a Cave Swallow nest. We then took turns posing under the cascade, with Nathan kicking it off posing like a weightlifter! Our hike back down was fast because we were looking forward to heading to the coast, but we slowed to a stop when Nathan spotted a Coral Snake. This was the first snake in the wild we have seen. Nathan made sure everyone got a chance to see it. We headed back down the road to Maya Center where we stocked up on chocolate products at Che’il. We were all excited to buy the products we had learned how to make after our chocolate tour the day before — YUM YUM YUM! At Pelican Beach Hotel in Dangriga we enjoyed a beautiful view of the Caribbean as we relaxed over lunch. Our luggage filled the bow of the boat, and we sat towards the back for our ride to Pelican’s Pouch at Southwater Caye. We were shocked when we had an hour of free time to get ready for our first snorkel. We met on the beach to try out our snorkel gear. After making sure that everyone’s masks fit, we swam over the Turtlegrass to our first reef. We saw lots of fish including Stoplight Parrotfish, Fairy Basslet, and a Nurse Shark! We stayed with our buddies and spent nearly an hour “oohing and aahing” into our snorkels before it was time to get back. Our evening meeting was with a view of the sunset, and after dinner we spent a little time stargazing and identifying constellations. We saw at least three shooting stars, too! We are enjoying this transition from jungle to sea. Our last day at DuPlooy’s started off with breakfast burrito and a huge THANK YOU to the staff who took such wonderful care of us during our stay. 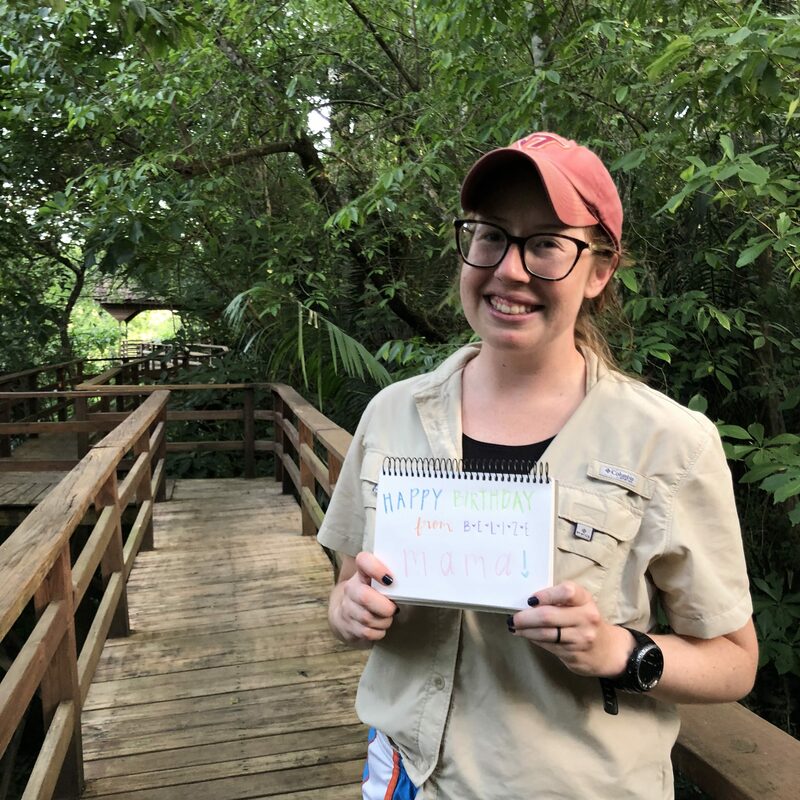 It was hard to leave, but the Belize Zoo and our hero, Sharon Matola, awaited us and we did not want to be late! Only two hours separated us from some of the most amazing animals that we would ever see. Can we go on permanent vacation in Belize? We pulled up to the zoo, parked and made our way inside to be greeted by Queen Green, the resident boa constrictor. Each of our group members was able to take a once in a lifetime photo of themselves with the boa. Even those of us who were scared of snakes could not resist the Queen. She had just shed her skin and her light blue shimmer was eye-catching, to say the least. As we made our way through the zoo, we were in awe of everything from the hand-painted signs to the opportunity to go behind a “Staff Only” fence and give a crocodile a foot massage. We loved seeing Chiquibui, the Jaguar, who was a surprise to the zoo after her mom joined the family, carrying a little surprise stowaway with her! Our favorite visit was with Indy and Sparks, the tapirs. Tapirs are the national animal of Belize, but were once plagued by myths regarding their supposedly aggressive behavior, although you could have fooled us! Indy and Sparks were friendly, playful and kind. We even were able to feed Indy his favorite snack of carrots and scratch his back, which he loved. The most incredible part of the Belize Zoo, however, was being able to meet the heart and soul of the zoo: Sharon Matola. She is a hero to many of our group members and, likewise, people around the world. What she has done for the people and animals of Belize is nothing short of a lifetime achievement. She left us with the idea that “no animal is unteachable” and we could not help but agreeing and will carry that sentiment with us into our classrooms. From the zoo, we visited the market in Belmopan to grab some unusual fruits for an exotic tasting. Have you heard of craboo or soursop? We hadn’t either! The next stop was the Blue Hole, a crystal clear pool of blue water tucked into a rocky cliff. There was even a cave only accessible by swimming and you know we had to check that out. It was as solid as the rock we stood on to take a group picture. 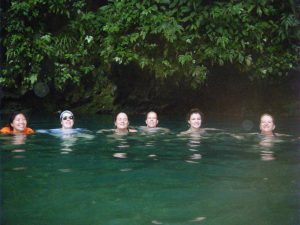 A quick dip was all we needed to recharge before we headed to the Jaguar Reserve and the Mayan Center. We arrived just in time to head out in search of tarantulas and scorpions, which we found immediately. After an early morning bird walk on Saturday, we headed off to the remote village of Monkey River to meet the people and interact with the students. Our teachers planned engaging activities to challenge the minds of these young learners while getting to know them and their culture better. A delicious lunch prepared by former students of Monkey River school hit the spot and we hopped on the fishing boat to cross back over to the mainland, but not before catching sight of a gar fish! On the way home we stopped at the Mayan Center to get a personal chocolate making lesson from Julio, whose family has been living on that land for over 100 years. We were able to make chocolate from cacao seeds and it was the best chocolate we have ever tasted. Julio even gave us a lesson on the history of Mayan culture and how the Jaguar Reserve has affected the Mayan people. Ecotourism is the livelihood of the village and the community is thriving. We are in love with Belize; so much. Now, on to the sea turtles. Out of the jungle and our way to Southwater Caye! We are heading to the Jaguar Preserve and don’t expect to be able to connect again until Sunday night! One of the many amazing things about Belize is how awake and ready we are to hit the ground running when that 5:30am alarm goes off! 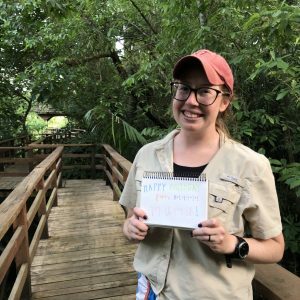 We began our day with a walk through the Belize Botanical Gardens, where we saw Jackfruit, Ginger, Tamale leaves, Angel’s Trumpets and the Lodge’s Solar Panels! After breakfast we were lucky enough to see Collared Aracari Toucans by the deck! 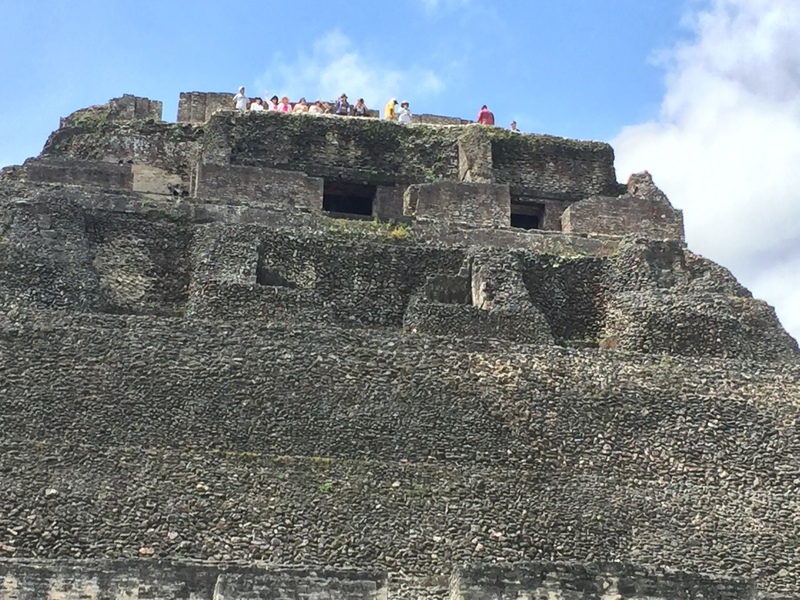 We then traveled to Xunantunich where we hiked on and up Mayan ruins. It was breathtaking! 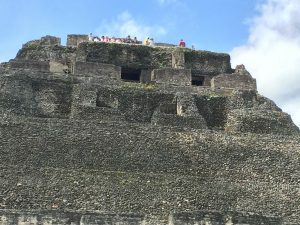 We explored the residential areas for nobility — El Castillo (“the castle,” in Spanish) is 130 feet above the plaza floor. It is the second-tallest building in Belize. The Mayans were at their peak around 500 or 600 A.D. Approximately 7–10,000 people lived at Xunantunich, with around one million inhabiting the country. After an awesome morning, the day just got better! After lunch we grabbed life jackets and paddles and met at the beach on the Macal River. We jumped in canoes and spent several hours floating and paddling (about seven miles). The wildlife was plentiful and we were surrounded by bird noises, iguanas, rapids, bats and teachers talking. When we got off the river we were treated to visit to a local ice cream joint! So delicious! We had all kinds of flavors new to us — sour sop, sweet corn, and crab. Also flavors we knew such as coconut, pineapple, chocolate, etc. We headed back to DuPlooys to learn about figs and get ready for dinner! Tuesday — The day begins at “0-dark 30.” Even thought most of us were up before 4am, everyone seemed to be awake and cheery. 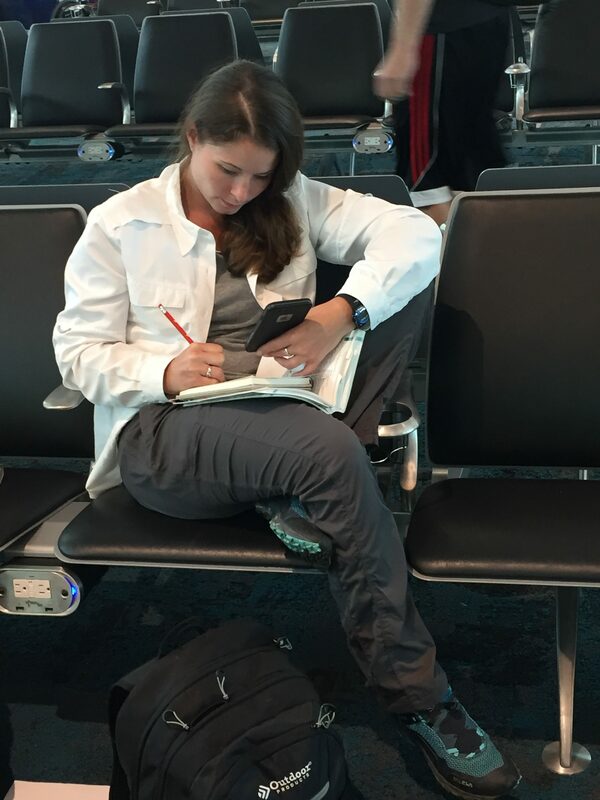 Liz saved the day on our first flight by responding to a medical emergency. GO LIZ! Happy to report the passenger who fainted is fine. We landed in Belize, met Nathan (our guide), Bruce (our bus driver) and Nora and Armin (our Belizean educators). Our first stop was to meet former participant Ryan Elijio! On to the Community Baboon Sanctuary, where we saw a mom and baby Howler Monkey. They came to say “Hi.” Mom came first and we were amazed that she came close enough to touch, BUT THEN the baby followed in her exact same path, and we were so close we felt as if it saw our souls! We learned the names of many plants and tasted cashew fruit. We also learned they make wine from it! 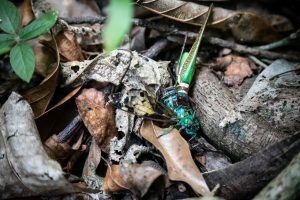 We went on to duPlooy’s Jungle Lodge where we enjoyed a delicious dinner and a night walk where we found a sleeping Basilisk Lizard down by the Macal River. Wednesday — We took a bird walk where we spent much of time looking at plants and insects. We tasted Velvet Apples (Diospyros discolor) and had fry jacks for breakfast. We then drove to the Mountain Pine Ridge where we hiked to the Domingo Ruiz Cave. 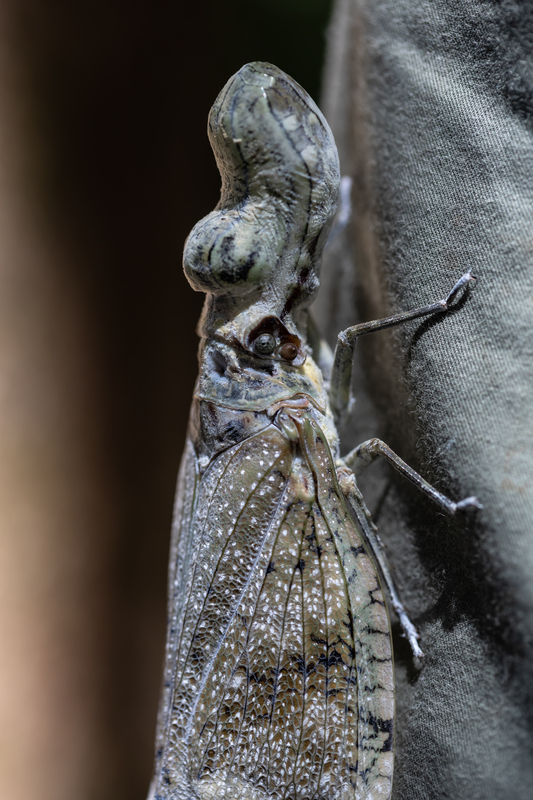 We found a Peanut-headed bug on a tree and got to see its beautiful eye spots. The eye spots of the Peanut-headed Bug. Jason was “done for the day” with that find! 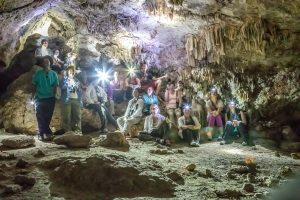 Group in Domingo Ruiz Cave. Later in the cave we saw a baby bat snuggled next to its mom and we could hear their wings when we sat in the pitch dark. We later sang in the dark because it sounds so good in the cave! 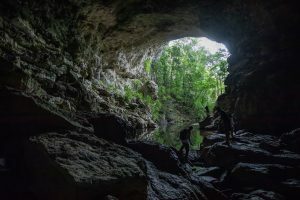 The Rio Frio Cave was an amazing experience and contrast to Domingo Ruiz Cave. Rather than being deep and subterranean, it was huge and open to a river on both ends! And we watched in amazement as a katydid ATE a cicada! We finished out the day playing in the waterfalls at the Rio On Pools, and returned to duPlooy’s in time for quick showers and a meeting before dinner. Then, off to a night walk topped off by looking at insects attracted to a sheet and bright light that Jason set up. And RACHEL wanted to send a BIG birthday greeting to her mom! The group heading to Belize! We have made it to Fort Lauderdale and are eagerly awaiting our next flight. The teams are currently researching birds and plants we will see from the bus. Lots of great laughter already! Shannon working on her journal. 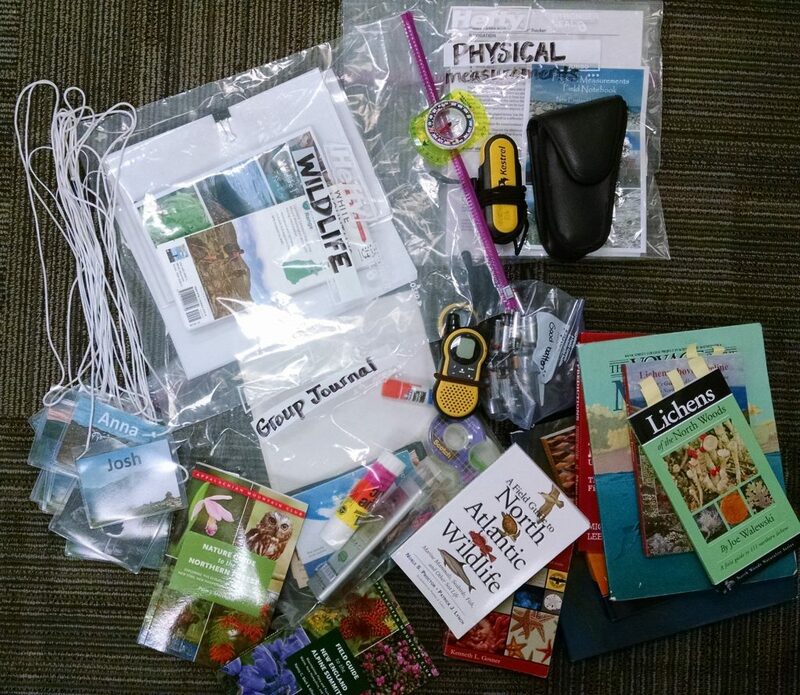 Twelve teachers from across the state are packing their bags with everything they need for the upcoming Tropical Ecology Institute. Convertible quick dry pants, umbrella, camera, binoculars, water bottle, rain gear, sunscreen, snorkel gear … and the list goes on and on. It is at this point that we all begin to wonder “Will all of this fit into my duffel?” And yet every year, somehow it does. Thirty-one years ago the first Tropical Ecology Institute for educators took place. While today’s trip takes advantage of advances in technology, improved roads, and access to new locations in Belize, at its heart, is it the same experience. It is designed to give educators a first-hand experience in tropical ecology, which will improve their ability to teach students across North Carolina. It is not a vacation in the tropics, it is an immersion in the tropics. While participants gain new factual knowledge, they also develop a deep appreciation for Belize and her people, and learn new skills to take back to their classrooms. Teachers return refreshed, inspired and more committed to improving science education across the state. We cannot wait for it to begin. Today is the end — the end of our time together in Maine and New Hampshire. The end of our time experiencing these wild landscapes. The end of sharing our daily experiences with each other. The end of achy feet and sore muscles and smelly clothes. The end of our Educators of Excellence Institute to New England. But, as the saying goes, every end is a new beginning. The beginning of our memories. The beginning of our planning and collaborations. The beginning of our lifelong friendships. The beginning of sharing our stories and pictures and inspirations with our students and friends and families. We are excited for what lies ahead. Grateful to be enjoying our big breakfast together as the rain pours down outside. As the rain poured down outside (and we all expressed deep gratitude that we made it off the trail before this weather system moved into the area! ), we gathered for a well-deserved, hearty breakfast at the AMC Highland Center. We didn’t have to rush our eating in order to have time to stuff everything in our packs and lace up our boots for another long hike. This morning was different. This morning as we gathered together we could take our time — time to reflect on what we will take away from this trip and how we will use these experiences in our classrooms. It was inspiring to be able to brainstorm and share our knowledge with one another, and to see creative sparks fly among so many passionate educators all in one room. How bittersweet it was, knowing that this would be the last time (until our reunion in November) that our “trail family” would all sit in a circle, sharing time together. On our way to the airport, we shared our last meal at the Gypsy Cafe where we talked about our regrets and our appreciations. It’s important to verbalize the things we may have regrets about, to acknowledge them so we can leave them behind and move forward in positivity — maybe we wished we looked at our watches or phones a little bit less, or journaled a little bit more. 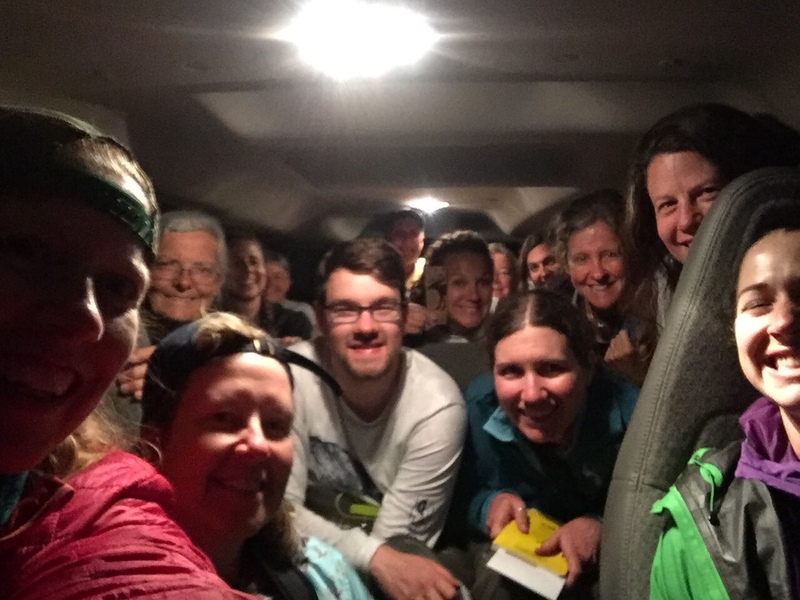 Our few regrets were drowned out by waves of appreciations for each other — lots of stories of kind words, smiles, and the ready laughter that were so abundant on our trip. We feel proud of ourselves for taking risks to try new things, for being brave in difficult situations, and for the commitment we make to translate these experiences and places into opportunities for our students (and colleagues) at home. We also shared how we feel connected to this land, and invigorated by time spent in wild places. 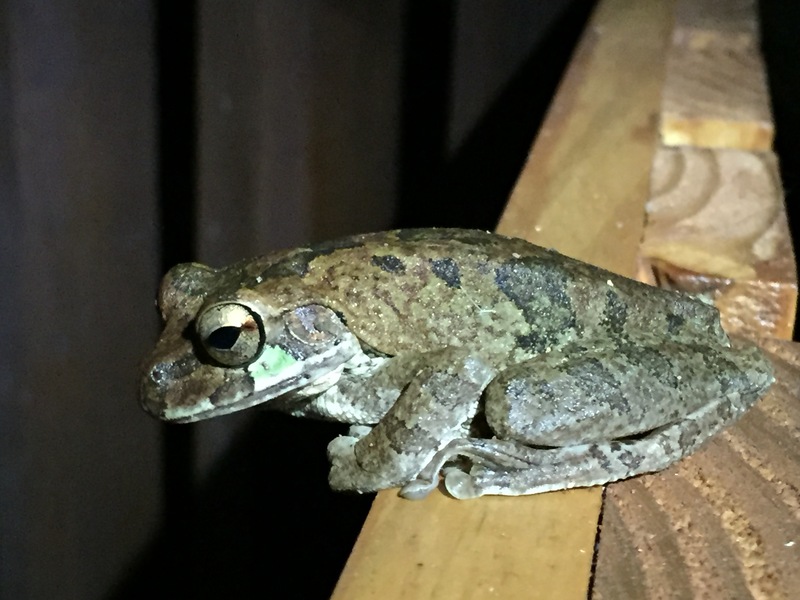 It is our hope that we can continue our adventures back home in NC and be the guides for the next generation of environmentally literate citizens, helping them to feel connected to, and compassion for, the natural world. Our task regarding creativity is to help children climb their own mountains, as high as possible. No one can do more. Remember that time we all piled in one car to sit on the side of the road watching a moose and her baby? 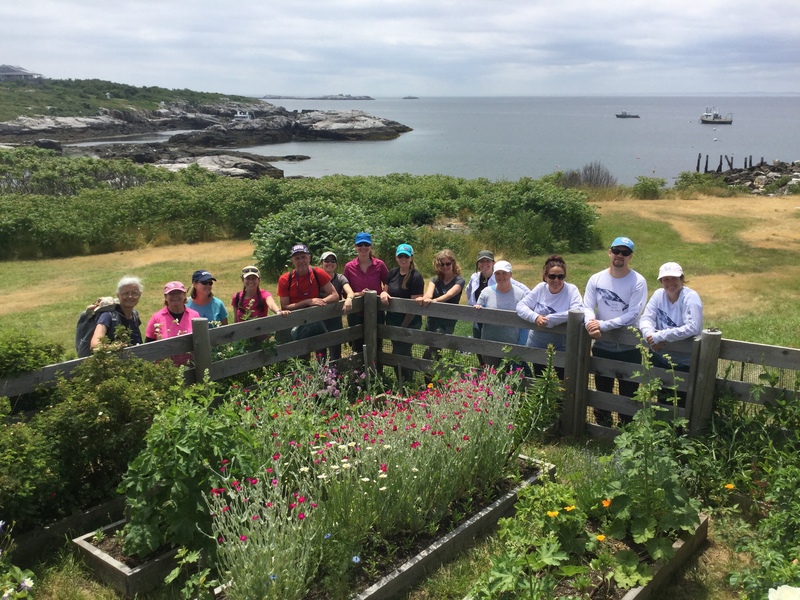 The fabulous educators of the New England Institute- view from Celia Thaxter’s garden on Appledore Island, ME. Each AMC hut prides themselves on the daily chalkboard interpretations of place, croo names, and (not pictured) the menu for the day. We awoke this morning at Mizpah Spring Hut at an elevation of 3,777 feet. After filling our bellies with croo-made pancakes, we had a relatively easy 2.7 mile hike down to The Highlands Center Lodge at 1,900 feet. On the way, we heard many songbirds, saw some red squirrels and a chipmunk, and transitioned into the hardwood forest. In the forest, we saw several tiny American toads; they were so cute, and camouflaged perfectly with the leaf litter on the trail! 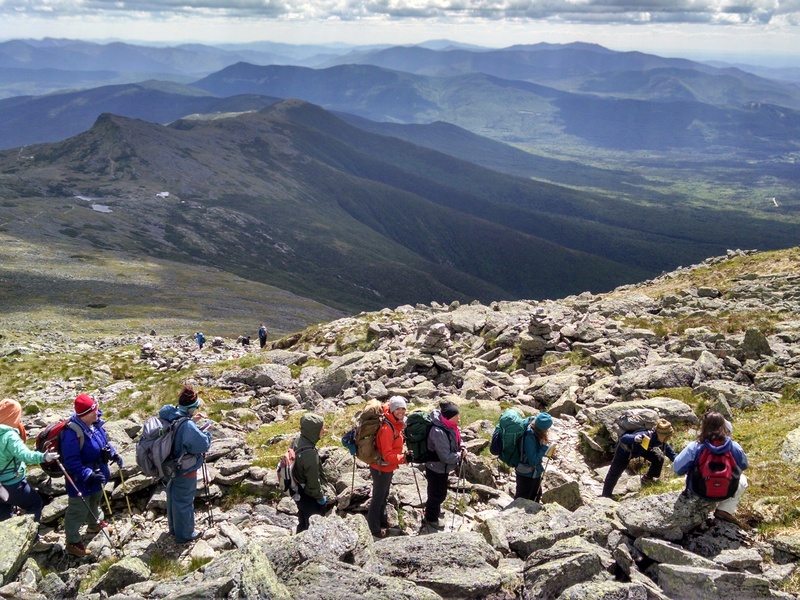 As we descended from the Presidential Range, the terrain began to feel much more familiar to us. We traded the gray, rocky landscape above tree line for various shades of green below. We were surprised to find lots of water along our path in the forms of small springs and creeks. This culminated into the highlight of our hike: a stop at Gibbs Falls. It was a lovely respite. 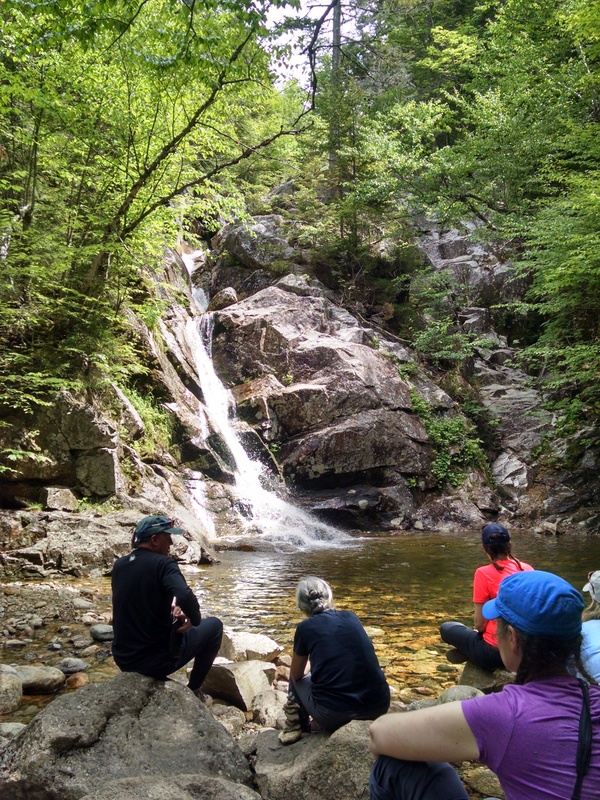 Our team stopped and sat quietly, listening to the peaceful sounds of the rushing, cold water. The cool air surrounding the clear pool beneath the falls refreshed us as we bolstered ourselves for the final half mile of our hike. Before long, we began to once again hear the telltale signs of civilization. 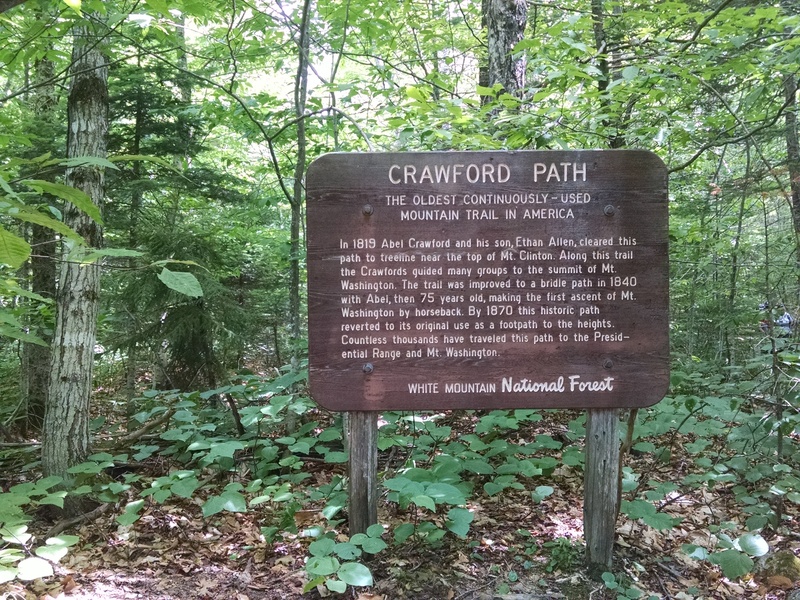 Our time on the trail ended with a sign marking the Crawford Path, the oldest continuously used mountain trail in America. As we emerged from the forest and onto asphalt, the feeling was bittersweet. Our hike retraced historical footsteps along the Crawford Path. We checked into the AMC Highland Center, ate our lunch of salads, soups, and sandwiches, and then all of us made a mad dash towards our first hot shower in several days. After a bit of time to relax and reflect on the last leg of the trip, we took a stroll around Ammonoosuc Lake, a small, spring-fed body of water that is just down from the main building. Along the trail around the lake, we saw lots of wildflowers (including lupine and two different colors of lady slippers (a spring ephemeral wildflower), tadpoles, evidence of spotted salamanders, and an owl pellet. Beautiful lupine along the Ammonoosuc Lake trail (Photo: Josh Reed). As we finished our stroll, we took the opportunity to dub one another with creative trail names. 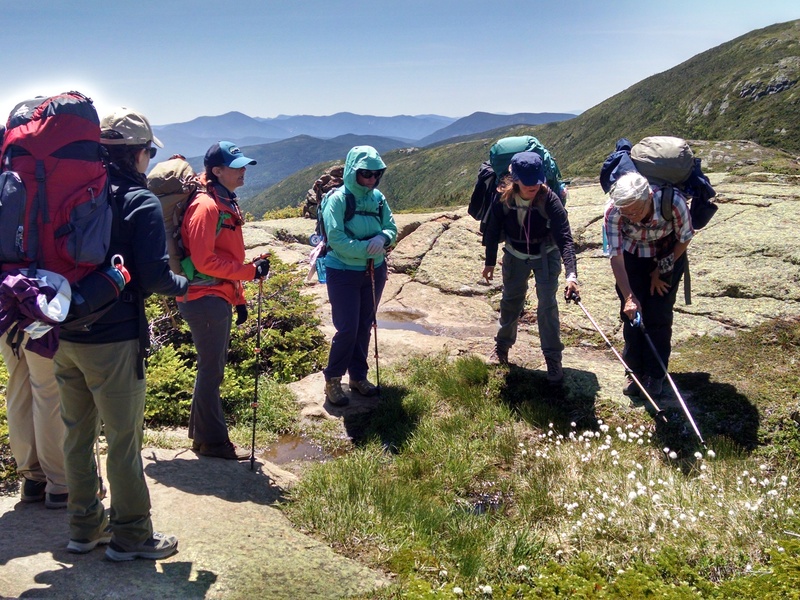 This is a common practice for through-hikers along the Appalachian trail, but a person cannot create his/her own trail name, so this turned out to be a great demonstration of our camaraderie and admiration for one another gained throughout our adventure. As we wrapped up our final evening group meeting, we watched as the clouds turned dark, indicating a storm on the horizon. The looming dark skies contrasted with the beautiful weather our group has been thankful for throughout our many adventures this week. 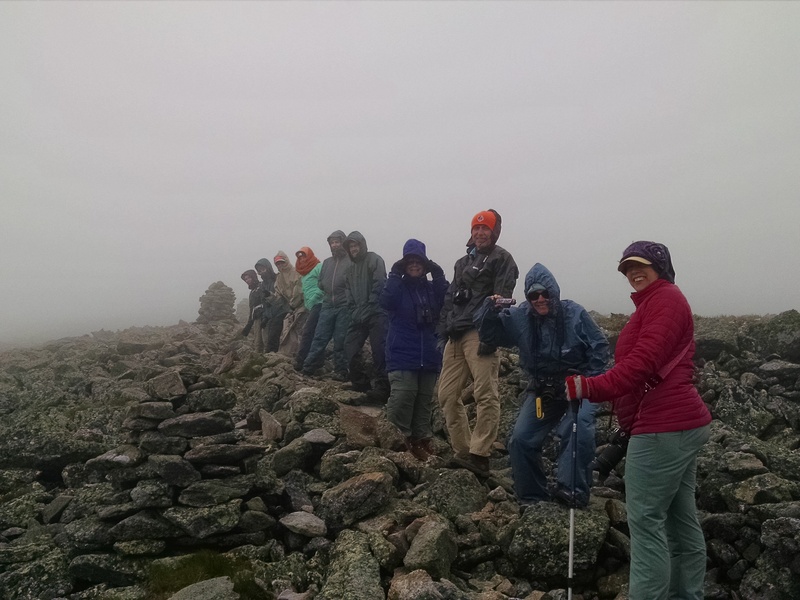 We began our early morning with a fun-filled, Harry Potter-themed breakfast hosted by the Appalachian Mountain Club “Croo” (crew) at Lakes of the Clouds Hut at the base of Mt. Washington. Immediately after breakfast we began our strenuous nine-hour hike up mountains, down rocky slopes, and across alpine meadows. The beginning of the steep hike up from Lakes of the Clouds to Mt. Monroe (you can see the Mt. Washington Observatory behind us in the distance). We hiked across (or around) the summits of Mt. Monroe, Mt. Franklin, Mt. Eisenhower, and Mt. Pierce, and ended our trek at Mizpah Spring Hut. We worked tirelessly as a team all day — supporting each other with gear, shoulders to lean on, and words of encouragement. Frances shares her passion for plants with us when we discover a patch of “bog cotton” along the trail. Now it is one of our favorite plants from this new environment! Our group ended the day with a delicious meal and tired feet. Dinner was filled with laughs and a great sense of accomplishment. As we fall asleep tonight (which won’t take long! 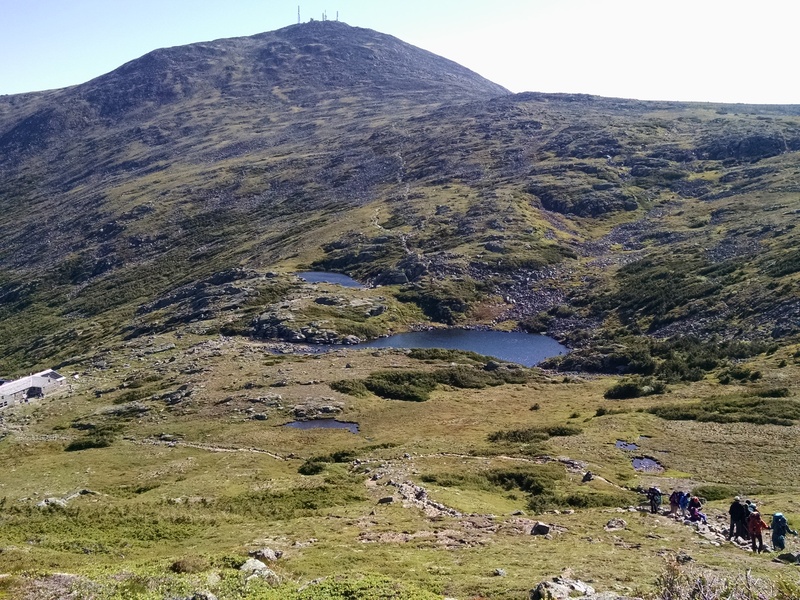 ), we can reflect back on all the different habitat types we hiked through — from the treeless alpine zone, to krummholz (trees stunted in their growth due to extreme weather conditions), to the boreal forest. Tomorrow is a new (and shorter!) day and we will hike down into the northern hardwood forest. Look how far we’ve come! 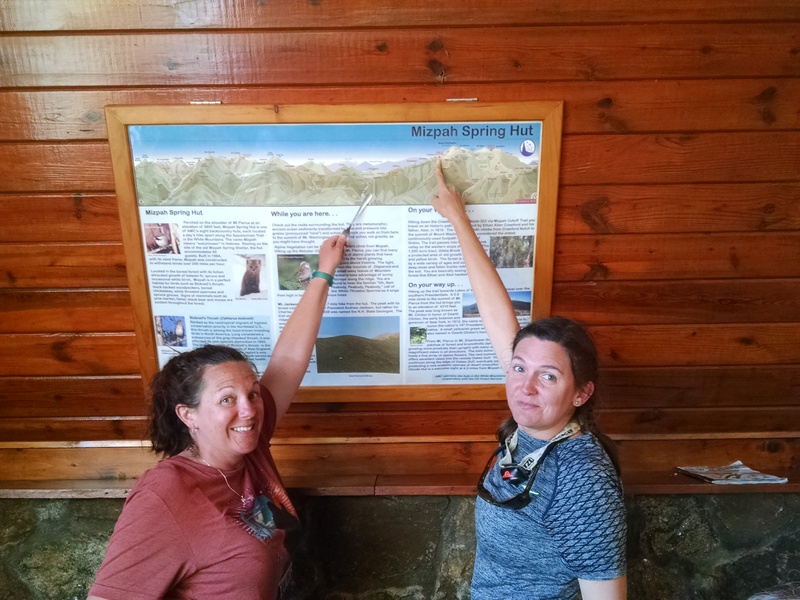 Five miles (9.5 hours) later, we arrive at our destination- Mizpah Spring hut. Today was a day of surprises. We ascended Mount Washington this morning, and were scheduled for a visit to the Alpine Garden. This was not your ordinary garden. The Alpine Garden (almost): not many readily visible flowers unless you look very closely! Renee holds a Snickers bar with a wrapper that says “cray cray” which pretty much epitomized the weather conditions we experienced today. Instead of 85 degrees and sunshine, this garden thrives in 45 degrees and lots of wind. Instead of a lush meadow full of flowers, we found rocks. Lots of rocks. But if we looked closer, we could see some tiny, tenacious, treasures — miniature alpine flowers like cranberry (which we sampled, and we can verify that they tasted like craisins), sandwort and Diapensia (a relative of our pixie moss). Mostly it was very cold, very windy and very unexpected. 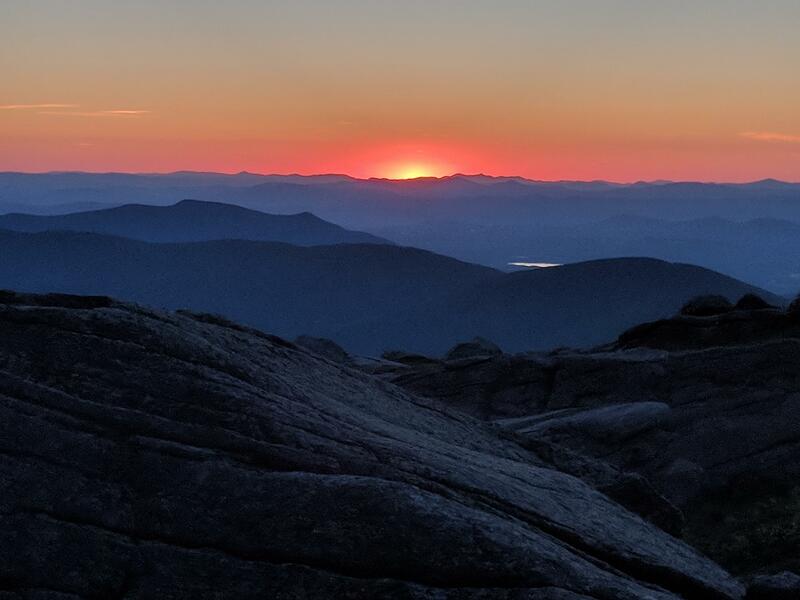 The summit of Mount Washington – site of the highest human-recorded land wind speed — 231 mph. Looking down from the inside of the Observatory tower. 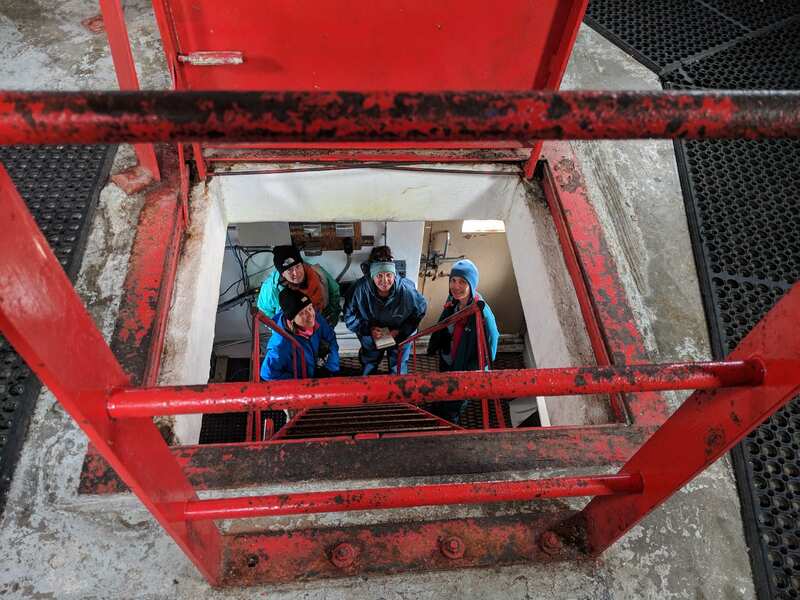 Once at the top, we got treated to a behind-the-scenes tour of the Mount Washington Observatory. It was so neat to see how all of our data that appears at the click of a mouse is painstakingly collected by lots of instruments and dedicated souls. We also met the observatory cat named Marty! On our way down, with the help of AMC Air Quality Scientist Georgia Murray and her intern Lauren, we learned about some of the citizen science monitoring that is happening with the alpine flowers. We will be able to help collect observations the next few days. Documenting the phenology (timing of plant stages) helps keep a record of changes in timing as the climate warms. AMC Air Quality Scientist Georgia Murray (with her back to the camera in a red backpack) teaches us about monitoring phenology of alpine wildflowers. In the distance you can see the white roof of our destination hut, Lakes of the Clouds. Though it wasn’t far, the rocky, downhill trail was a challenge for many of us, but we helped each other along the way and made it to Lakes of the Clouds Hut safely in time for dinner! Tomorrow we have our longest-mileage day ahead of us, and we don’t anticipate having cell signal to post the blog until Wednesday. 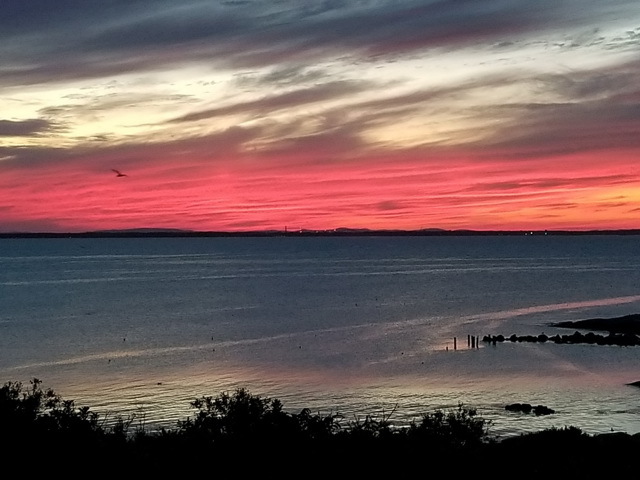 We will fall asleep tonight after a spectacular sunset with the fading glow on the horizon. Sunset from Lakes of the Clouds hut. The morning was cool and cloudy but warmed up nicely to reveal blue skies. 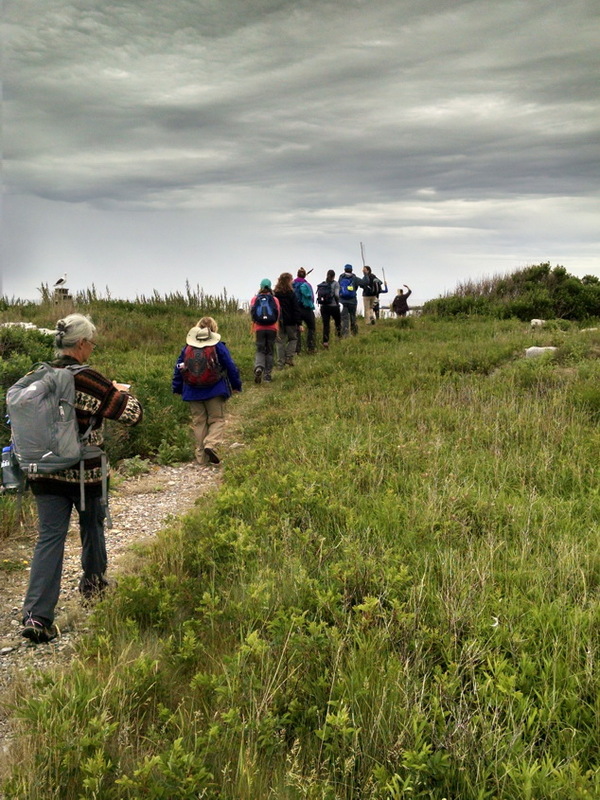 It is our final day on Appledore island. Nature can be calming and nature can be cruel. I think some of us are leaving with the sense that we are glad not to have been born a seagull. The nesting colony of gulls here face numerous hardships, but also enjoy unlimited beauty. Blair witnessed a vicious gull attack where one herring gull attacked another, presumably to dine on its one and only chick. A battle ensued and gulls were tossing and flopping about, with locked beaks and making perilous sounds. The battle ended in successful defense by the parent of the one chick. Whew! 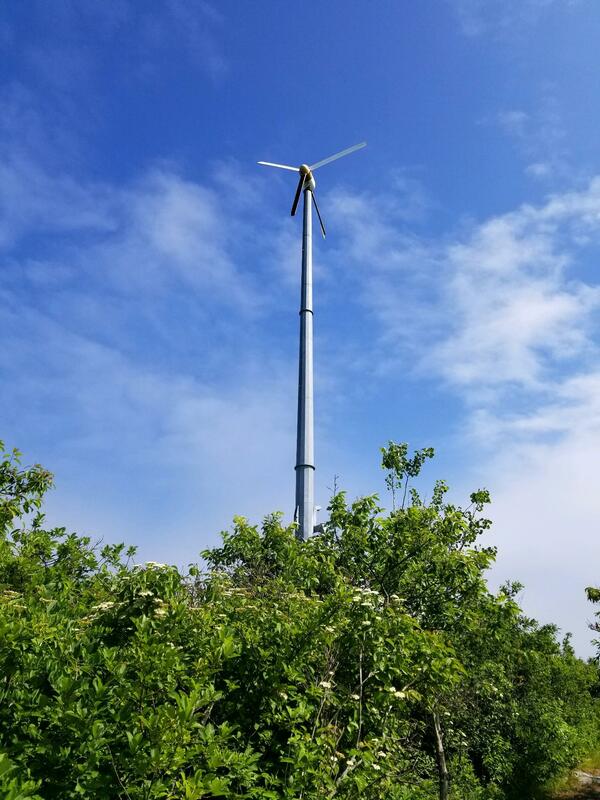 The wind turbine that helps generate some electricity for the island. Not pictured are the many (gull poop covered) solar panel arrays that generate the bulk of the power for the island. We finished our time on the island with two tours. Our first one highlighted the sustainability features of toilets, electricity generation, water usage, and hot water generation. 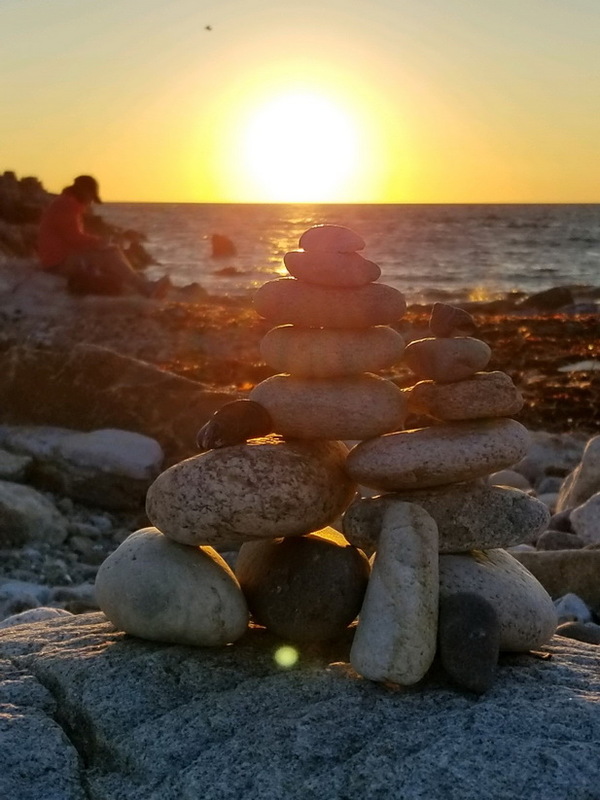 Over the years, Shoals Marine Lab has been installing solar panels, a wind turbine, rain water catchment systems, and composting toilets to conserve valuable resources in a remote location. The rain water can currently only be used for watering Celia Thaxter’s historic garden because the rooftops are covered in gull droppings. Celia Thaxter was the daughter of the owner of the once-grand Appledore hotel, and she hosted many different artists in her home, including Childe Hassam. Shoals Marine Lab keeps the garden up to preserve a part of the island’s hotel-era history (which ended abruptly in 1914 with a devastating fire). 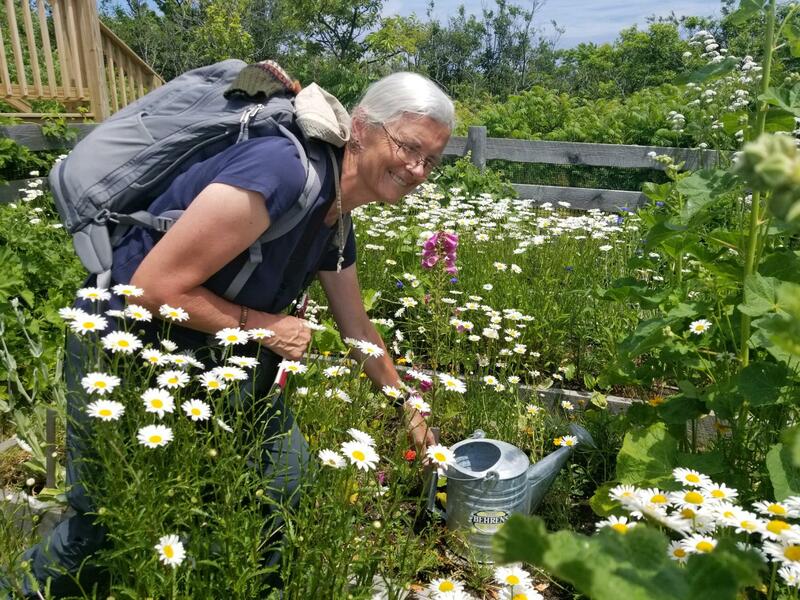 Though people can’t drink the rainwater captured from the rooftops, Celia’s garden has benefited from these additional nutrients and the flowers were spectacular. Frances channeling the spirit of Celia Thaxter in her garden. Photo: Renee Pagoota-Wight. Once on land (and back in New Hampshire), we quickly descended upon Sanders Fish Market for quintessential lobster rolls. 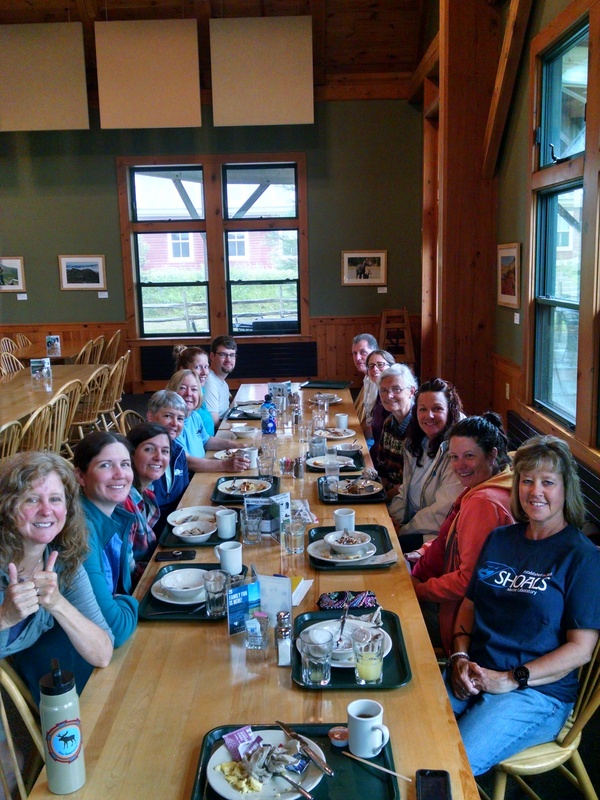 Everyone ate with vigor and we continued our journey north to Joe Dodge Lodge (at AMC Pinkham Notch Visitor Center). Sadly the only wildlife we spotted along the drive were two roadkill porcupines, and one (fortunately) live red fox. We cannot wait for “luxurious” rooms and showers (which were limited on the island to conserve water). And then, as we were closing our day on a quiet wetland boardwalk near the lodge, our meeting was interrupted in the best possible way — when a momma moose and her yearling calf decided to join us at the pond! (OMG!!!!!!) 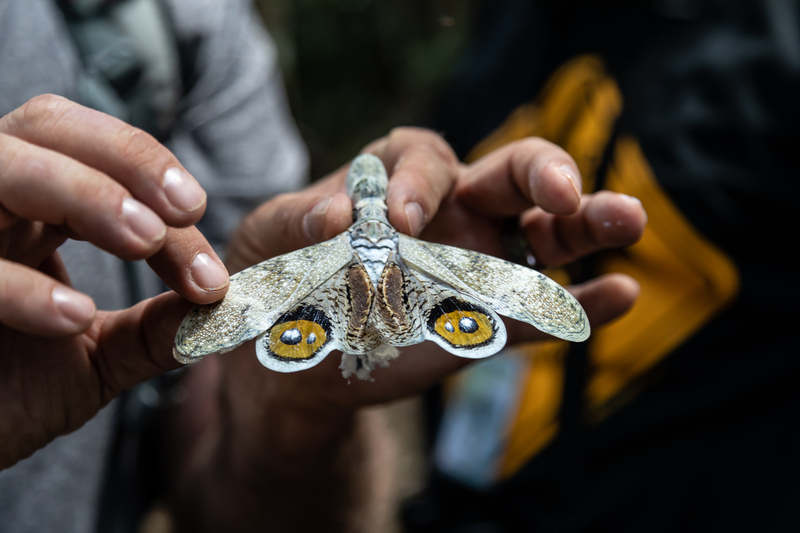 Our unexpected visitors left us thrilled and excited to see what other surprises these new terrestrial and alpine environments hold for us over the next few days! *Note: We may not be able to post blogs again until we get off the trail again on Wednesday. This morning we went hiking around the northern coast of the island. 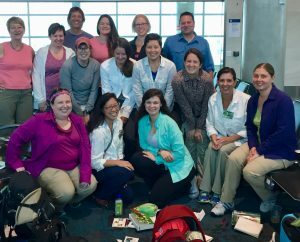 We traveled with Lab Coordinator Bonnie Clarke and External Relations Coordinator Alexa Hilmer as they guided us on a two-hour tour. Bonnie focused specifically on the geology of the island, highlighting the fact that the island is mostly granite with portions of other strikingly visible igneous and metamorphic features (e.g. dikes). Standing in the same spot as Childe Hassam, overlooking Broad Cove. You might notice that the tide during our visit today was higher than in the painting. In part two of the hike, Alexa continued our discussion of the American impressionist painter Childe Hassam. She brought prints of some of his paintings from Appledore and we had fun trying to find the specific location and the exact vantage points (lines of sight) where he sat to create his masterpieces. Even today, almost a hundred years later, we continue to be inspired by the same, ever-changing views of light on rocks and water. One of our animal observations from the hike was that the gulls on the northern cliffs definitely seemed more anxious of humans than those nesting around the dorms and labs. We got to witness two gulls locking beaks in a heated battle for territory and dominance. It was neat to see up close some of the behaviors we had learned about the day before! As the morning continued, we hiked south towards Smith’s Cove. This southernmost tip of the island contained some phenomenal evidence of both glacial movement as well as metamorphism within the granite. And (perhaps most importantly? 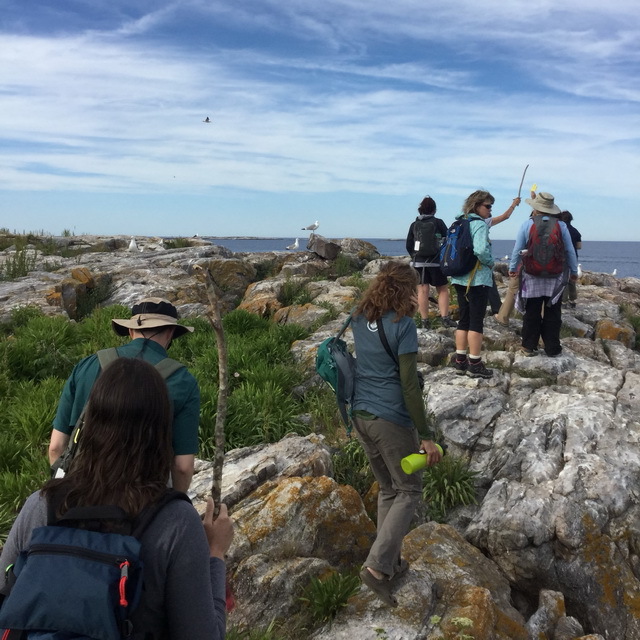 ), since the southern end of the island is not a nesting area for gulls, our team got to enjoy a momentary respite from the attack birds as we examined and discussed the rock formations. 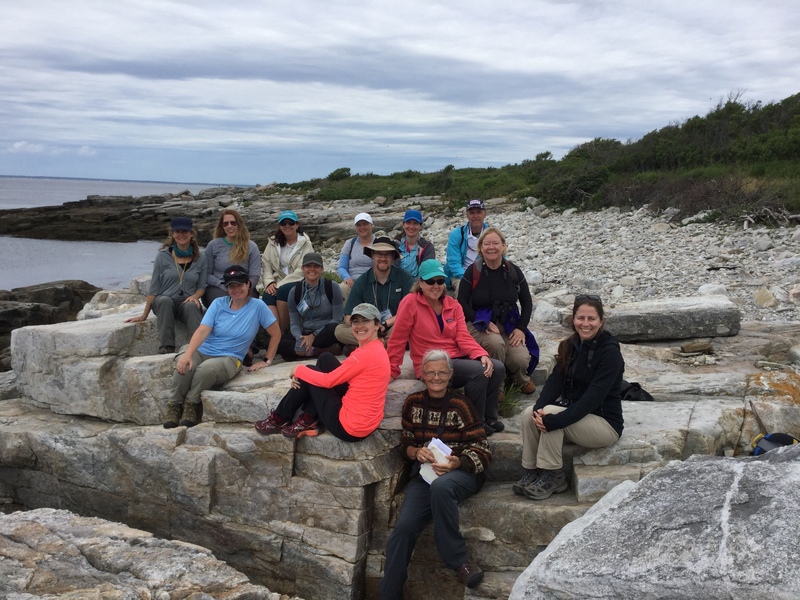 A peaceful image of our group on the rocky southern coast of Appledore Island. After our great morning walk, we had the opportunity to hear from the REU (Research Experience for Undergraduate) student interns. 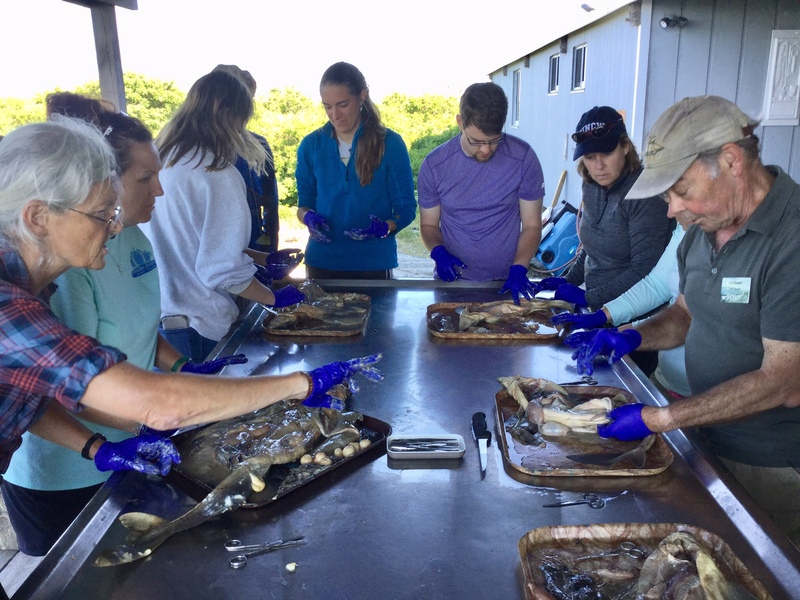 In addition to two-week course offerings, undergraduate students also have the opportunity to apply for research intern positions that allow them to research for 10 weeks on the island. Some of the topics the 2018 interns are researching include: sea animals eating plastics; parasites that possibly influence green crab behavior; the effects of sound vibrations on hermit crabs; and seal populations and entanglements. We hope our students back home will have such amazing opportunities for themselves in the future! After lunch and a seal identification crash course from Alexa, we were able to put our skills in identification to the test with a boat tour of neighboring Duck Island. Staying a safe (and federally-mandated) distance away we were able to practice distinguishing the different characteristics of the Harbor Seal and Gray Seal as we viewed them “hauled out” on the rocks and bobbing in the water near our boat! The highlight of the day was our attempted visit to the tern colony on White Island. Last night, Dr. Liz Craig taught us about the Common, Roseate, and Arctic Terns; These three tern species are the subjects of conservation and restoration programs on the Isles of Shoals. We were prepared to visit the island via small inflatable rafts that required a water landing (our feet would get wet) and then we were going to explore what promised to be a loud and messy tern colony. Some of us were dressed better for this adventure than others. 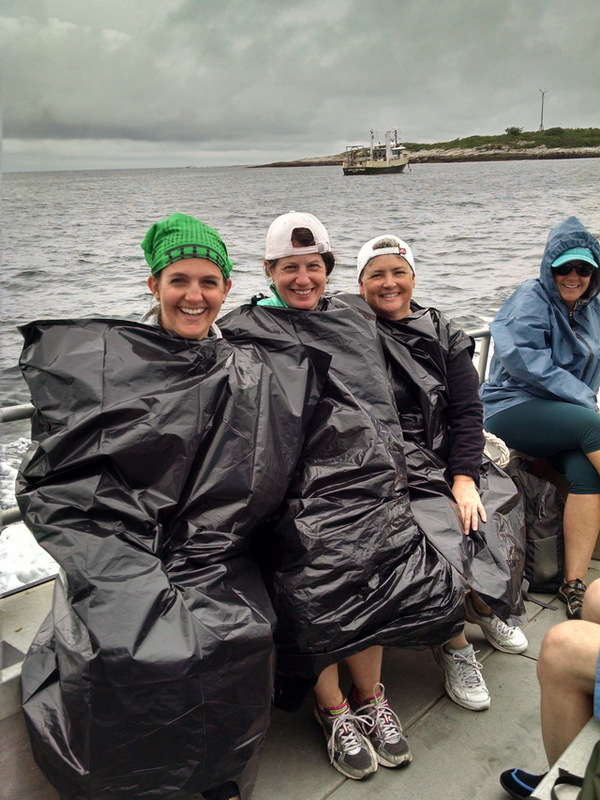 Compactor bags make great ponchos, protecting against not only rain but also lots of bird poop from angry terns. Alas, It was not meant to be. We learned first hand what Eisenhower knew when he said: “Plans are worthless, but planning is everything.” The weather was not cooperating, so we did what teachers do best and improvised our plans. Liz (who is now everyone’s rockstar role model) captured a few baby terns and brought them to us on the boat, which was securely moored just off shore! * Can you imagine?! We got to participate in taking measurements and banding baby terns aboard the boat. We learned the importance of banding to help scientists follow bird flight patterns and better understand their nesting behaviors. Everyone had a “tern” to hold a baby chick and we all hope to “retern” again someday! Josh holds a newly hatched Common Tern chick in his hands. If you look closely you can still see the tiny white “egg tooth” on the end of its bill. This helps the chick peck a hole into its eggshell from the inside so it can hatch! *Please note — no chicks were harmed during this quick, educational adventure. After being measured and banded, they were safely transported back to their nests on land. We all gathered at Broad Cove this morning to view a beautiful Appledore sunrise at 5:01am. It was a peaceful morning to pause and also channel our inner impressionist and use watercolors to create seaside postcards. 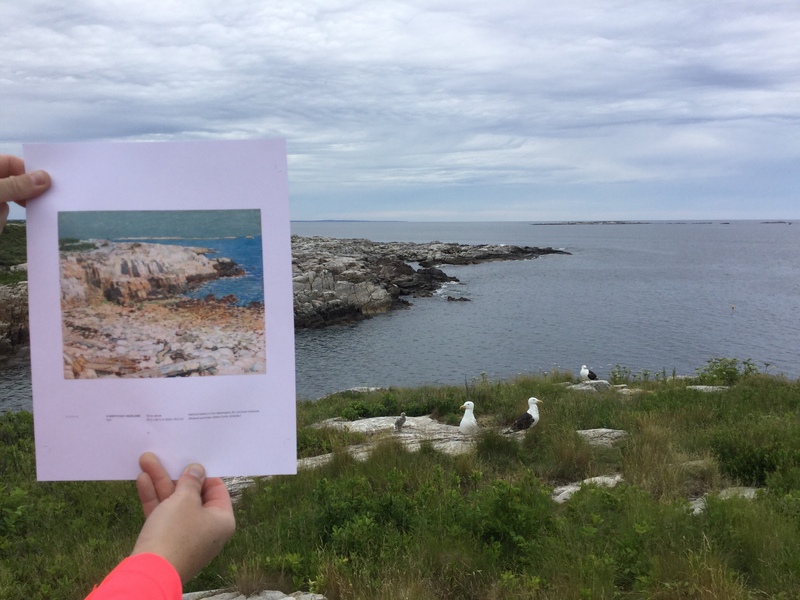 We learned that Childe Hassam, an influential American impressionist, spent 30 years using Appledore Island, Maine as the inspiration for his art. Impressionist artists focus on light and colors and Hassam often went straight to nature for his inspiration. Sunrise at Broad Cove. Photo: Renee Pagoota-Wight. 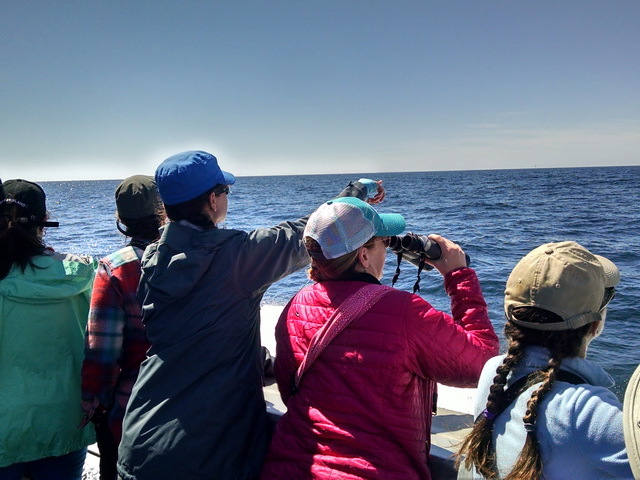 Later this morning, the group prepared for our whale watch experience by learning about the two types of cetaceans. We were most impressed with the beautiful baleen samples we were able to examine and touch. 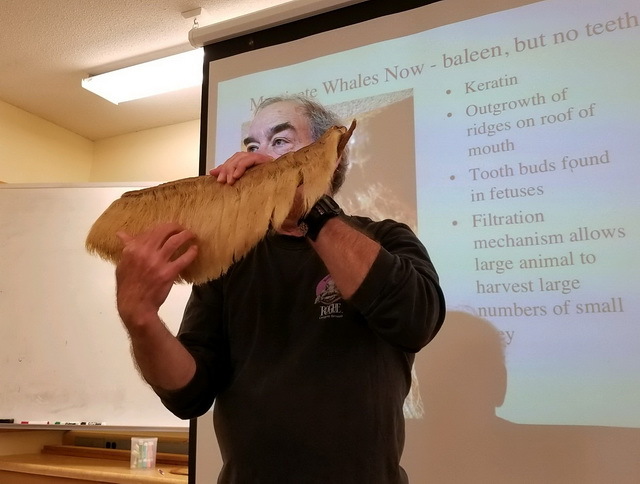 Dr. Hal Weeks demonstrating the filter feeding powers of baleen. Photo by Renee Pagoota-Wight. We departed Appledore Island shortly thereafter on the University of New Hampshire marine and ocean research ship, the Challenger R/V. Our group paired with a class of undergraduate students, growing the number of passengers onboard to 38 people. Is that a whale over there? 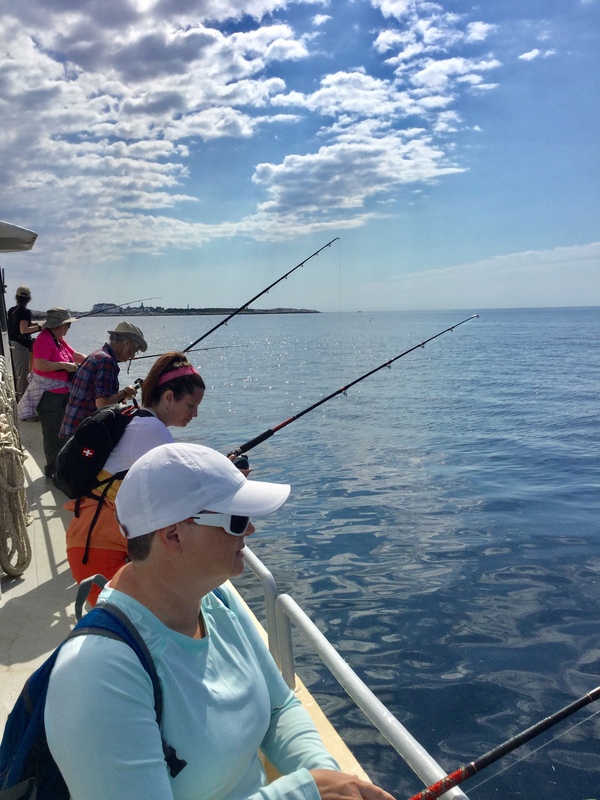 Good weather and calm seas were expected for the journey and we eagerly anticipated observing a variety of whales and sea life. We were not disappointed! We saw several Fin and Minke whales, White-sided dolphins, and even spotted an enormous Basking Shark lurking right below the surface. 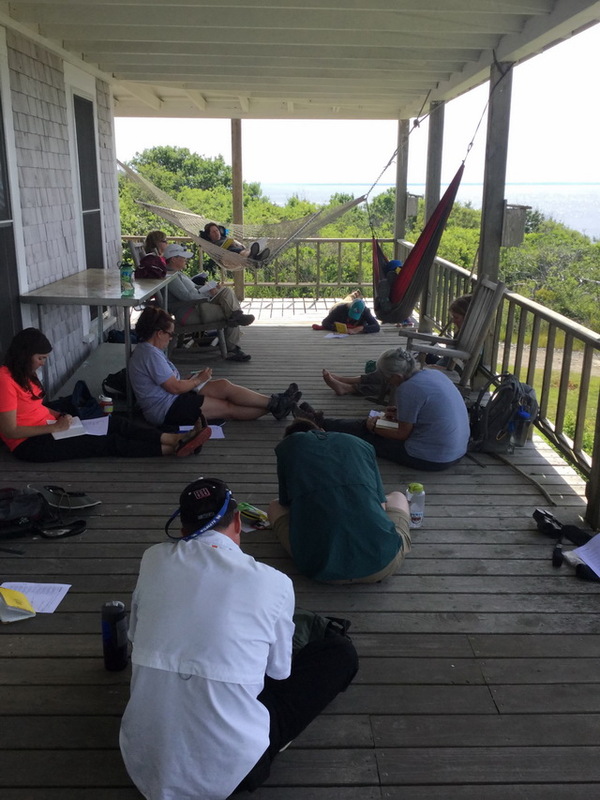 Once back onshore, Naila Moreira, a poet and faculty member from Smith College, met us on the Laighton building porch overlooking the dock and beautiful ocean cove. We interpreted environmental poetry, and even tested our creative writing skills by writing marine-focused poems. Naila then joined us on a walking tour of the gull colony with Dr. Liz Craig, academic coordinator from Seavey and White Islands, where she serves as the caretaker and researcher during the summer for the tern conservation colony. She was able to help us understand the behaviors of the Great Black-Backed and Herring Gulls. Approaching the gull colony, defense sticks at the ready to prevent a possible attack. After our visit to the full colony, we returned for a delicious dinner. One of the most outstanding parts of our trip has been the meals served to us on the island. Each meal consists of a variety of healthy, nutrient-rich options, all of which are filled with fresh vegetables and fruits. In addition, the chefs have done an amazing job creating vegan, gluten-free, and dairy free options. Tonight we even had flourless chocolate cake for dessert! Sunset across Babb’s Cove. Photo: Renee Pagoota-Wight. We had an extra early morning today for our first island sunrise from Broad Cove. We watched the colors spread across the sky in the company of gulls sitting, flying and calling from the surrounding rocks. We returned to the observatory deck of the central Commons building to pause and re-adjust our senses: shifting from a mainland mentality to an island one. We are still coming to terms with a new place that can seem both big and small at the same time. After a delicious breakfast, we left dry land to fish for mackerel. On the way to our fishing spot, the ocean was still and flat on the surface, but there was wildlife everywhere! We passed a grey seal along with plenty of cormorants, gulls and terns. The boat captain anchored us near an area of upwelling, where warm water currents bring nutrients from below up towards the surface. Within 15 minutes, fishing lines were reeled in with 4-5 mackerel per pole (some even had 6 fish at a time! ), faster than we could get them off the hooks! 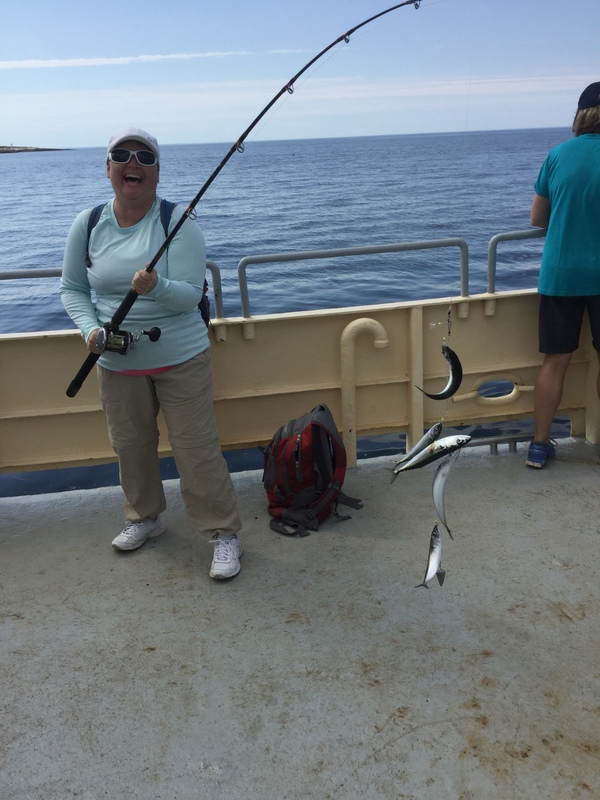 Cheryl hauls in a big catch — five at a time! We motored back to the island to squeeze in our next exploration of the area’s tide pools. 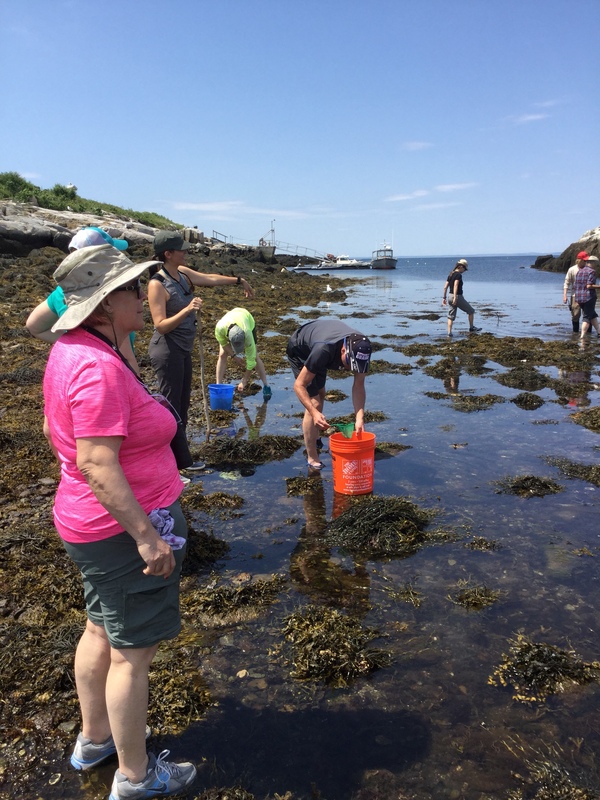 Intertidal zones are a harsh environment with drastic changes in temperatures and water levels, and we had an opportunity to find and observe the organisms that are adapted to survive in these conditions. Our wading was paused by the excited discoveries of hermit crabs, a Gunnell fish (it looked like a small eel), periwinkles, barnacles, small sea urchins, and a variety of algae (what we might call “seaweed” in the South). There is great joy to be found in taking the time to search for life that is often hidden just beyond our sight. “Signals for Survival” was our after dinner movie treat. We learned about the behaviors of the herring and Great Black-backed gulls that we have observed while staying on the island. Effective communication between gulls is essential for their survival, and we reflected how true this is for humans too. Dissecting dogfish to learn about fish anatomy. Hurry up and wait. That seems to be the theme for today. New England Institute Day One: it was an early start, with everyone arriving at the airport at 4:15am, or thereabouts. Though bleary-eyed and caffeine-deprived there is excitement in the air. We are all anxious to smell the salty air and catch our first glimpse of the island. The learning-about-each-other process begins as we share stories and talk about the things we are most excited to see. We talk about the families we leave behind, the school year we just completed, the travels we have taken or want to take. As the miles pass under us, we start to feel more and more like a cohesive group. We are in this together. To learn from each other and from the lands we are about to explore. By mid-morning we landed in Manchester, New Hampshire and drove east to Portsmouth. Then we lunched at the Portsmouth brewery. Some enjoyed chowder or sweet potato soup while others dined on fish sandwiches and fries. With our bellies full we headed to the dock and the ferry to our destination — Appledore Island, Maine. We shared the bay with cormorants and black-backed gulls and motored (in the heat of day) towards Shoals Marine Laboratory. We weren’t on just any old ferry, we arrived today with the weekly food shipment. Once we docked, a human conveyor belt of more than 50 people formed to make the unloading process work smoothly. It was quite a sight to see the wide assortment of cargo make its way up and over the rocky shore — boxes of kale or eggs; mattresses and luggage — all passed from hand to hand. All this took place in the midst of multiple pairs of very large and alert nesting gulls. 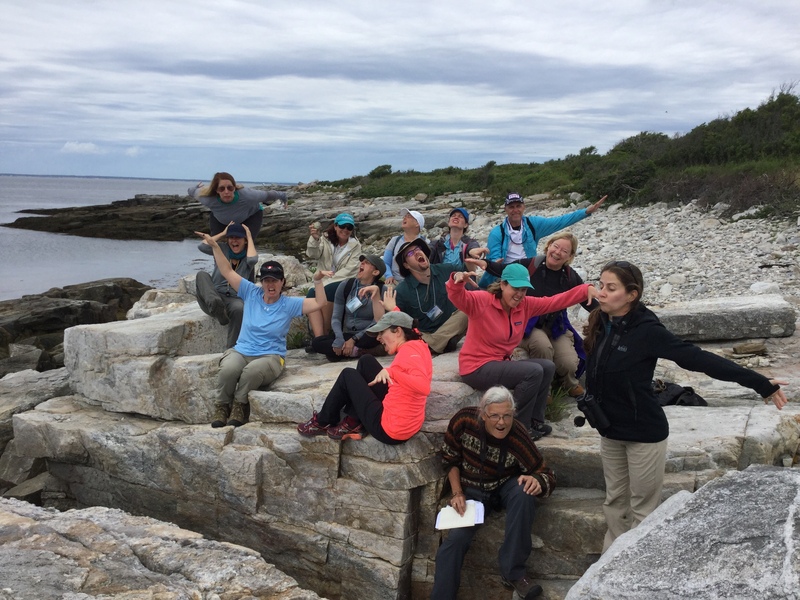 After a gourmet dinner on the patio, we learned about the geologic and human history of the Isles of Shoals (specifically Appledore Island and Shoals Marine Lab), presented by Drs. Hal Weeks and Jim Coyer. As the sun set in this postcard-like setting, which we are actually a part of, we observed a few moments of silence to take it all in. The raucous calls of great black-backed and herring gulls descended upon our ears. Words cannot describe the beauty of this island!! 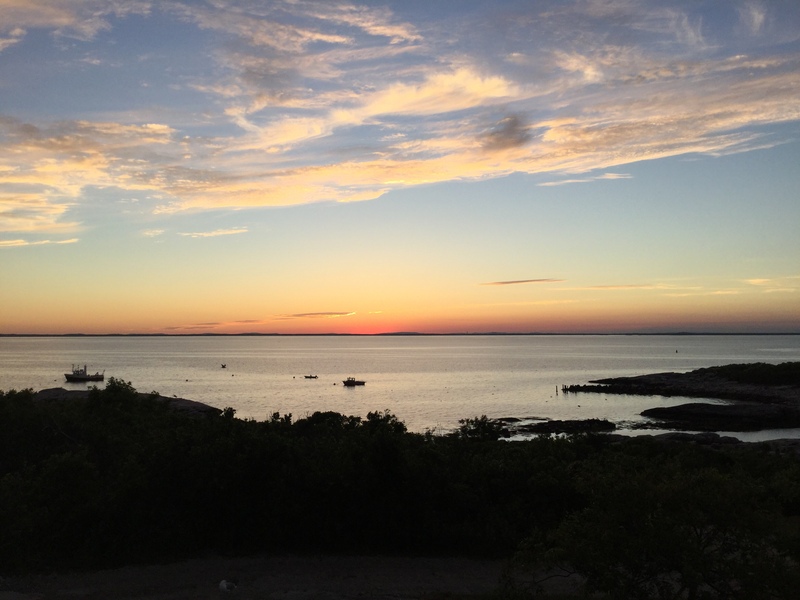 The sun sets on Shoals Marine Laboratory. These wise words by Dr. Seuss seem fitting on this last day of school for many of our NC educators. Today was good. Today was fun … and for our Educators of Excellence, tomorrow is another (fun) one! Tomorrow the summer officially starts and preparations for our New England Institute can begin in earnest! 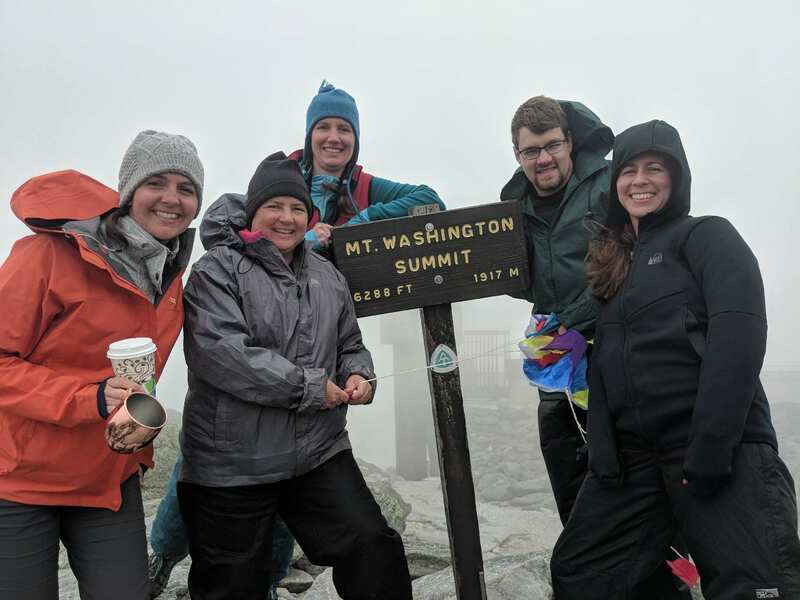 With their classroom doors closed, our phenomenal group of teachers can begin to shift gears — away from grading papers and staff meetings to dipping their toes in the chilly waters of the Gulf of Maine and being “blown away” by the winds on Mount Washington, NH. Our next week and a half will be full of wrapping up last minute tasks and packing, but then we will leave North Carolina to begin a grand adventure to New England! We can’t wait! There’s so much to do and see and learn! This summer, the Museum’s Junior Curators, high school students who volunteer weekly to help take care of the Museum’s animal ambassadors, are taking a trip to Yellowstone! 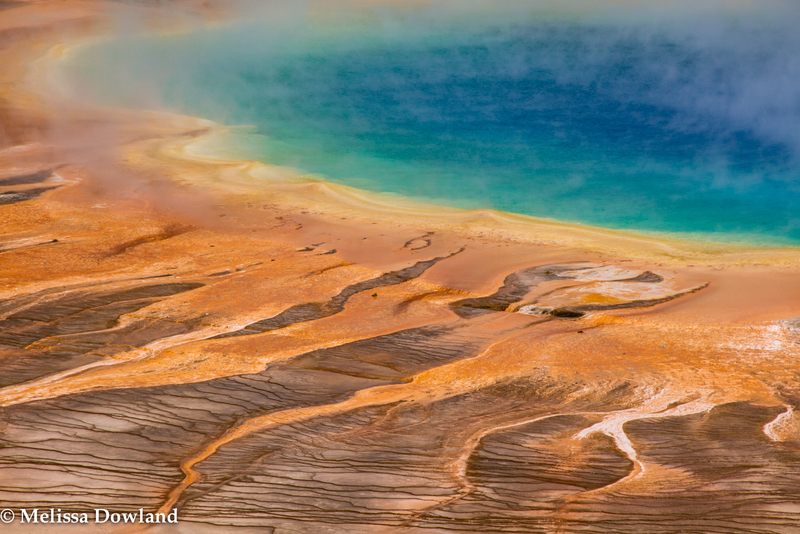 From June 14-21, thirteen students will travel with Museum staff to visit Yellowstone National Park. 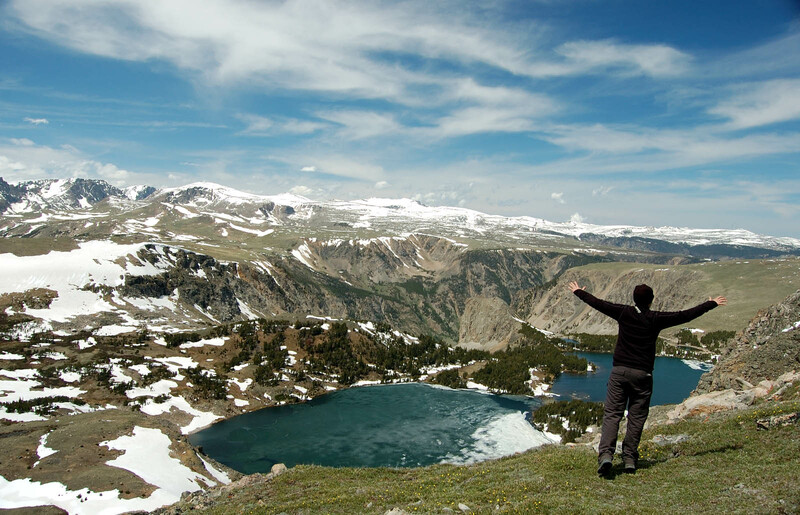 We’ll take time to learn about the Park’s amazing wildlife, observe the geothermal energy released in hot springs and geysers, and take some hikes into Yellowstone’s backcountry. The students will be posting blogs during the trip to the Museum’s Education blog site. We hope you’ll follow along! 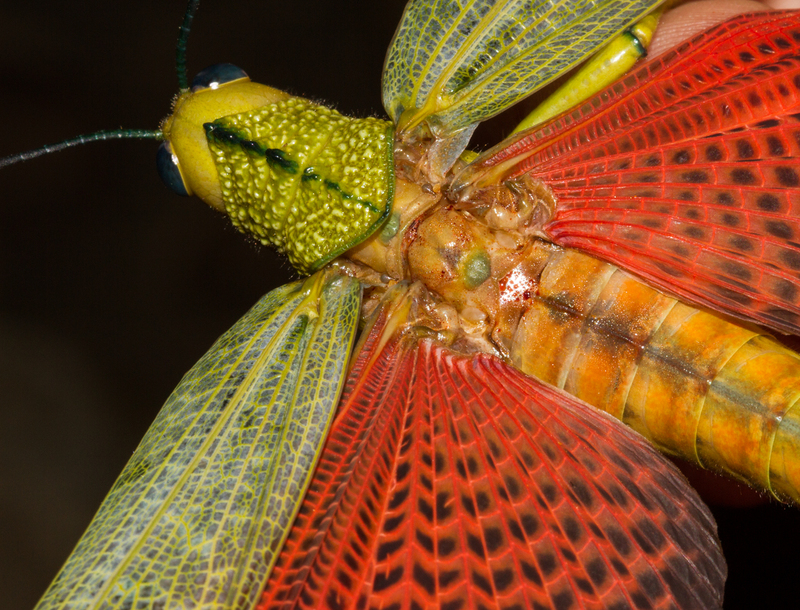 Coming soon- to a rainforest near you!